I realized I never shared my experiences of the 2016 Big Tent in Quartzsite, AZ. Today I will remedy that situation. I wrote about the history of the Big Tent last year, so anyone who doesn’t know what it the world I’m talking about, you can read all about it here: http://www.rubbertrampartist.com/2015/03/02/the-big-tent/. 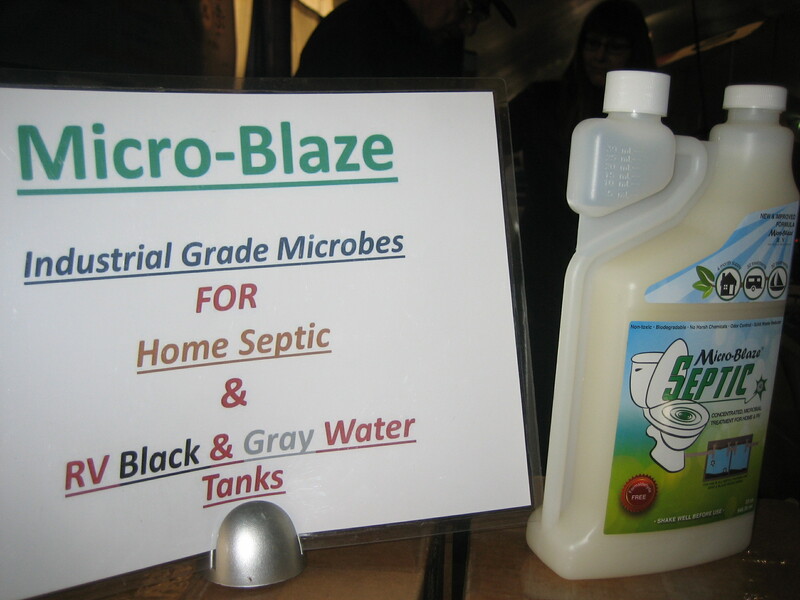 In brief, the Big Tent is shorthand for the The Quartzsite Sports, Vacation & RV Show. It’s literally a big tent full of booths for businesses trying to sell their wares to RVers who’ve come to town from around the country. Imagine the hawkers pushing gadgets at a state fair alongside companies catering to the wants and needs of the RV crowd; that’s the Big Tent. In 2016, I did not show up at the Big Tent on opening day. There was no need for that. I wasn’t looking for a summer job, and I wanted to avoid filling the van with unnecessary items, even if they were freebies. I believe I went on the Wednesday after opening day, on my last day in Quartzsite. One good-looking young East Indian man with a British accent drew me right into his booth. It was a large booth, and there were several people in it trying to sell the product, reusable heating pads. The pads were pretty cool There was a metal disc in them and when the disc was clicked, the goo inside the pad got hot. The pads could also be used cold by placing them in the refrigerator for a couple of hours. The young man was trying REALLY hard to sell the product to me. I finally had to tell him I wasn’t going to buy anything, but said he was doing a great job. We sort of squeezed each other’s hand in farewell, which made me a little giddy. …the funniest thing I saw in a booth was a man lying in a bed on a platform a couple of feet off the floor. 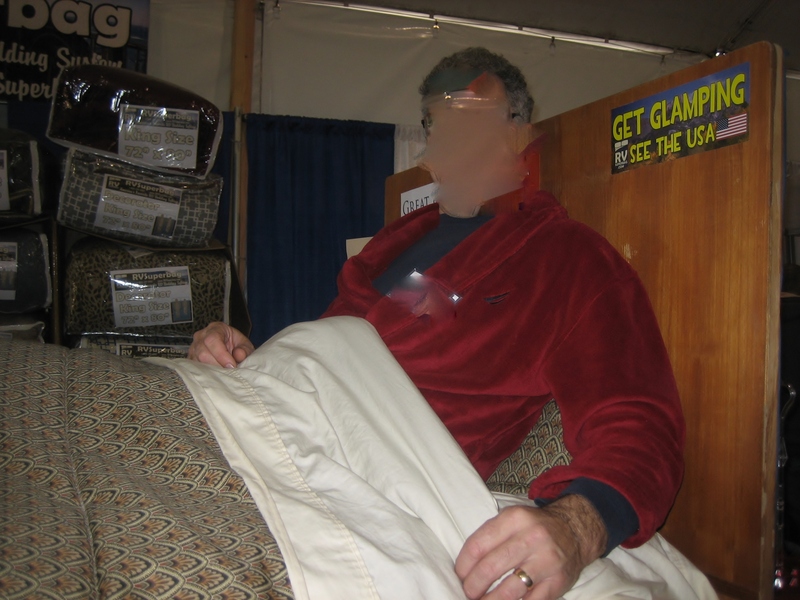 He was selling some special RV bedding, and he was demonstrating this bedding by lying in a bed. The big come-on with this bedding is that one wouldn’t have to make the bed if one had this bedding. Basically, the bedding was a double sleeping bag placed on top of a mattress. There was no tucking of sheets and blankets because this item was a blanket pouch. Is making an RV bed so difficult that people would rather sleep in a double sleeping bag? In any case, whenever I saw this grown man lying down in bed while trying to convince people to buy his wares, it cracked me up. This the sad sounding RV bedding salesman (identifying features removed). Sometimes when I stay in bed for days at a time, I feel depressed. Maybe this guy really needed to get out in the sunshine. This guy, even though he seemed really down, was the high point of the Big Tent for me. I walked around after I talked to him, got a bright yellow (and cheaply made) tote bag from KOA and played a sort of slot machine game with the Flo lookalikes at the Progressive, but nothing made me happier than finally getting a photo of this guy.